The NutriChef Sous Vide PKPC120BK is a well made unit that gets high marks for quality and workmanship. It has the most popular features most home chefs are looking for. Temperature Controls are a little awkward. No Bluetooth, Wifi, or Alexa capabilities. $74 Current Price - YOU SAVE 26%. The NutriChef Sous Vide PKPC120BK Precision Cooker is newer design that still has the great quality you have come to expect. This model has specifications, controls, and display that look suspiciously similar to the Gourmia Sous Vide GSV138 and we suspect they are the same model on the inside. 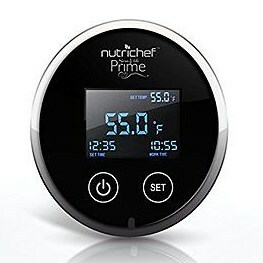 The NutriChef model currently costs $74.00 and the Gourmia costs $69.99 we suggest choosing whichever one has the best price. The NutriChef Sous Vide PKPC120BK is 16" tall making it taller than the average of the models we reviewed. The control housing is made of high impact polycarbonate material, and the heating element is encased in a stainless steel tube, overall the unit felt very durable and high quality. This model has an alligator style clamp, thus gives you quick and easy setup and take down, but doesn't give you as much flexibility to adjust the height vertically. This model is rated for 1200 watts of power, which is the very top of all the models we reviewed. It has a flow rate of 1.5 GPM which is slightly below the average of 2.0 GPM. This model was one of the quickest bringing water up to temperature because of it's high power and good flow rate. When you're using this in your kitchen, if you are doing any long cooking projects (over 4 hours) you are going to have to be mindful of evaporation and not letting the water drop. Having high power and a good flow rate has positive and negative aspects. The display and controls for this model are located on the top of the housing, this is slightly more awkward than models with an angled display. This should only be a real concern if height is an issue for you, people who are below average height might have difficulty reading this model. The actual display has the current temperature in a large format in the middle of the display. The set temperature is smaller and in the upper right hand corner. If your eyesight isn't good, or this will be used by someone older, they might struggle to read the set temperature. The set temperature is controlled using a scroll wheel on the back of the tube. It's slightly awkward back there as you have to feel for for it, but it's a minor annoyance not really a deal breaker. This model does not have Bluetooth or Wifi Connectivity and does not connect to an Amazon Alexa. 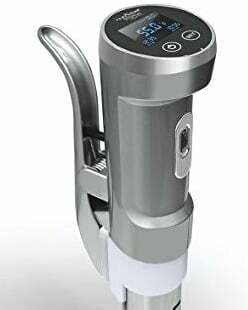 The NutriChef Sous Vide PKPC120BK precision cooker gets high marks for quality workmanship and durability, there are a few minor design annoyances, but overall this is a solid choice for most home chefs. 16" x 3.5" x 3.5" 11.1" x 14.8" x 4.5" 11.1" x 14.8" x 4.5"
The NutriChef Sous Vide PKPC120BK is overall a good machine, it gets high marks for quality and workmanship. There are a few design annoyances, but overall it's a model that most people will be happy with.